But how can you personally make much of a difference? Doesn’t it feel a little bit overwhelming? With the Small Action Big Impact campaign. The idea is to show everyone that if many like-minded people make the same positive change, together, we can all make a big impact. Make your pledge today! Taking hundreds of years to break down, it never truly goes away, existing as microparticles in our water and even our food chain. It’s estimated that plastic kills over 100,00 marines animals a year and 1 million marine birds. So what about that plastic we can’t see? An estimated 51 trillion microscopic pieces of plastic, weighing 269,000 tons. That’s about the same as 1345 adult blue whales. That’s 500 times the number of stars in our galaxy! But, wait! — Let’s not get disheartened. Yes, plastic is everywhere and is hard to avoid, but if we change our reliance on convenience and one-use plastics, we can make positive and sustainable choices that will make a difference. Bring your own shopping bags. Keep reusable tote bags or canvas bags near your front door, in your car, at work or wherever you can so you’re never without one. Plastic shopping bags are often used once and then thrown away, which then take hundreds of years to break down so invest in a few reusable ones. We’re not just talking about food shopping either, use them for any kind of shopping. Keep a reusable bag in your pocket, handbag or coat to get you into the habit, and never be in need of a plastic bag again. Carry a reusable stainless steel bottle instead. Many companies such as Chilly’s Bottles specialise in making reusable stainless steel water bottles that also look good and come in a variety of styles and colours to compliment you. Refill when you’re at work, at the local cafe or anywhere they let you! If you’re a coffee addict, get into the habit of carrying a travel mug or reusable flask. It’s great to grab a coffee on the go, but an estimated 2.5 billion coffee cups are thrown away every year — that’s 5,000 a minute! Though there are efforts to recycle coffee cups, a lot of them come lined with plastic which makes them harder to recycle and their plastic lids end up as plastic pollution. The way to combat this is to carry a reusable coffee cup at all times. Many coffee shops promote their own reusable cups and will give discounts to customers who use reusable mugs every time they order. 4. Avoid disposable cutlery and straws. Disposable cutlery and straws are the worst for plastic pollution, as, like plastic bags, they’re only used once before being thrown away. 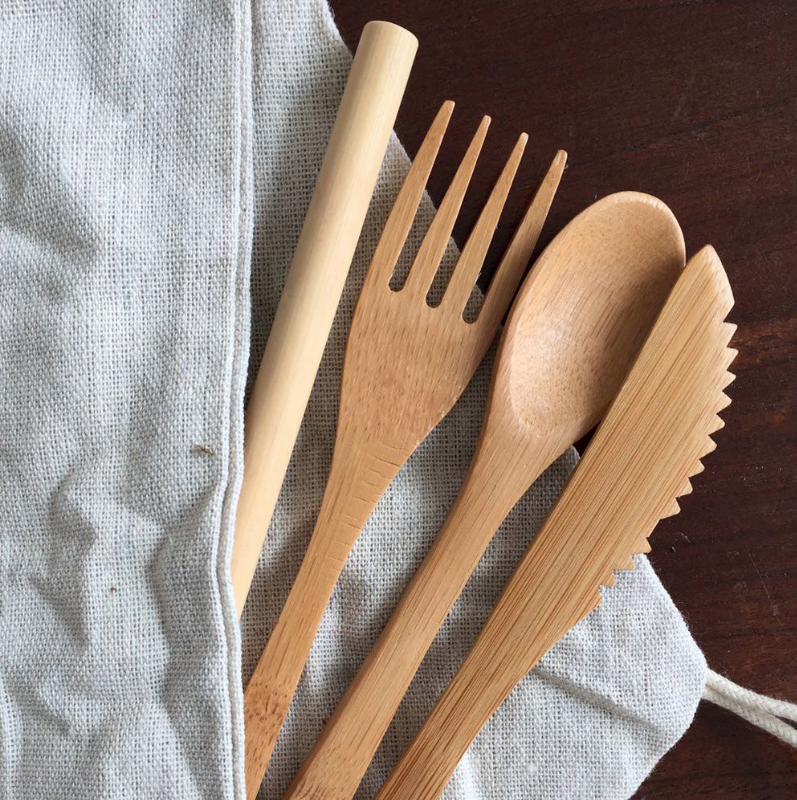 Instead, grab your stainless cutlery from home, wrapped in a napkin to use or consider using bamboo cutlery. As for straws, say ‘no thanks,’ or if you must use a straw, ask if they have paper ones, invest in a stainless steel or bamboo straw. At the supermarket, it’s easy to grab a plastic bag to bag up your fruit and veg, but in reality, it’s unnecessary. Use bags from home to bag them up or invest in some reusable mesh bags. Consider buying in bulk to cut down on plastic packaging and purchase beverages that come in glass bottles. 6. Store food in glass. Keep hold of those glass jars. They’re great for storing leftovers, dry foods and uncooked food as well as for using as take away containers for work lunches. We all love a takeaway, but with that convenience, comes plastic trays, plastic bags and plastic cutlery. Consider making an effort with more home-cooked meals. Alternatively, host dinner parties at home with friends who can all bring a dish in non-plastic containers. It’ll be great for the environment, and your wallet too! ● Avoid care products with polyethylene micro-beads. ● Buy clothes made from natural fibres, and avoid synthetics like acrylic, Spanx and nylon. ● Buy care products that come in metal or glass containers, or are made from bamboo or natural fibres. ● When travelling, decant your beauty products into travel size reusable containers instead of buying mini versions. ● Use cleaning products made from products already found in your house; one-part vinegar to 3 parts water as a surface cleaner for example. These are just some ideas to get started. Share these tips with friends and family, and see if they can think of any you haven’t. The aim is to innovate, be creative and find ways to live a life with less plastic. Visit smallactionbigimpact.com to learn more about our 12-month long campaign and ways you can get involved. Follow #smallactionbigimpact online and follow us on Instagram @smallactionbigimpact.